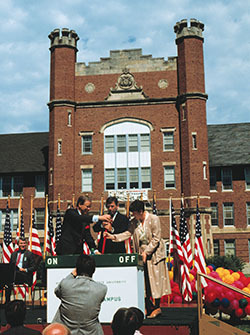 Northwest flipped the switch on its "Electronic Campus" in 1987. 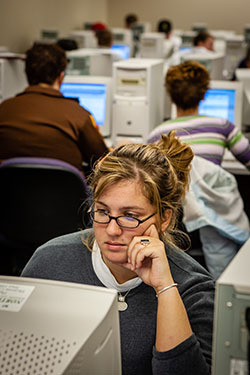 Computer labs were prevalent on the Northwest campus during the 1990s and 2000s as technology and internet access became ingrained in its academic culture. 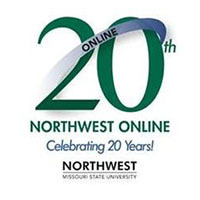 Northwest launched a new form of higher learning in the fall of 1999 when it began offering online coursework through Northwest Online. As the platform enters its 20th year, it continues to evolve in the ways it supplements the academic needs and learning styles of students as well as how faculty deliver course content. The University launched Northwest Online Aug. 3, 1999, a year after establishing its Center for Information Technology in Education, or CITE, with state-provided mission enhancement funding to support the instructional technology needs of Northwest faculty. Over time Northwest Online developed as an internet portal with supporting features and a course management system. CITE, meanwhile, has been reimagined as the Learning and Teaching Center and continues to support faculty through the development and sharing of pedagogical and content-specific knowledge in addition to providing access to professional development support and resources. “During the past 20 years, Northwest Online has designed a suite of online programs that reflect the Northwest quality of learning that is expected by learners,” said Dr. Darla Runyon, who was a staff member during the launch and now serves as director of Northwest’s Learning and Teaching Center. Dr. Roger Von Holzen, an associate professor in the School of Computer Science and Information Systems, was CITE’s first director and stayed in that role until 2013. Dr. Deb Toomey, an associate professor of marketing, was among the first faculty to implement the system into her instruction 20 years ago. She continues to use it today to keep course content organized and accessible to her students – and she says she can’t imagine her work without it. The impetus for Northwest Online can be traced back to 1987 when Northwest flipped the switch on its “Electronic Campus” and became the first public institution in the nation with networked computers in each residence hall room and faculty office. A decade later, Northwest had upgraded the network and all of its computer terminals, allowing students and faculty to use multimedia and the internet while further enhancing learning at the University. Internet access in homes was not yet prevalent, and the widespread adoption of smartphones and wireless internet was at least a decade away. By the late 1990s at Northwest, however, computer usage and online learning had become part of the fabric of the institution. Toomey remembers Hubbard discussing the program with her while he was visiting another school that was starting an online program. In December 2001, Christina Pasqua of Sterling, Colorado, became the first student to complete a degree through Northwest Online, earning her bachelor’s in business management. When Pasqua arrived to participate in the winter commencement ceremony, it marked her first visit to the Northwest campus – a path to graduation that once was unthinkable. 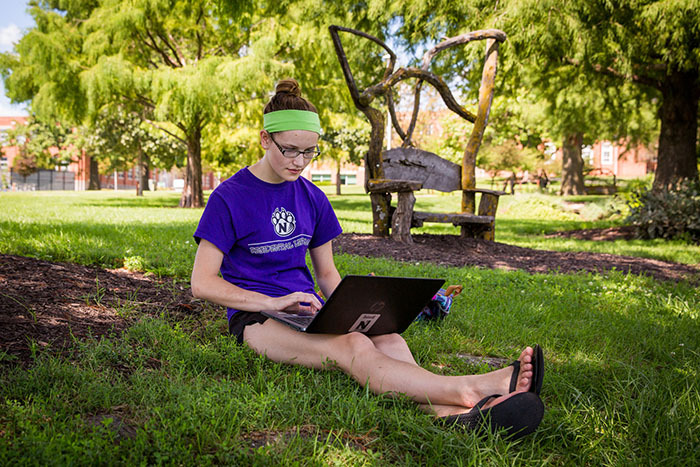 Today, about 536 Northwest Online courses exist with nearly 3,000 students enrolled each semester. Most Northwest Online students are campus-based, but the courses enroll students from throughout the world. It consists of 11 online graduate programs, three bachelor’s degree completion programs, and at least one general education course for each academic area. Blended courses, which consist of a combination of online and classroom coursework, also are established within Northwest Online. Kimbre Thrower will complete her degree online in December while spending the last year in Africa. Thrower earned her bachelor’s degree at Northwest and began pursuing her master’s degree in special education through Northwest Online while she was teaching in Missouri. Kris Reinertson graduated last spring with his master’s degree in geographic information systems through Northwest Online. The coursework helped him secure work at Legal Services Corporation, a non-profit organization in Washington, D.C., that provides civil legal aid for low-income Americans.